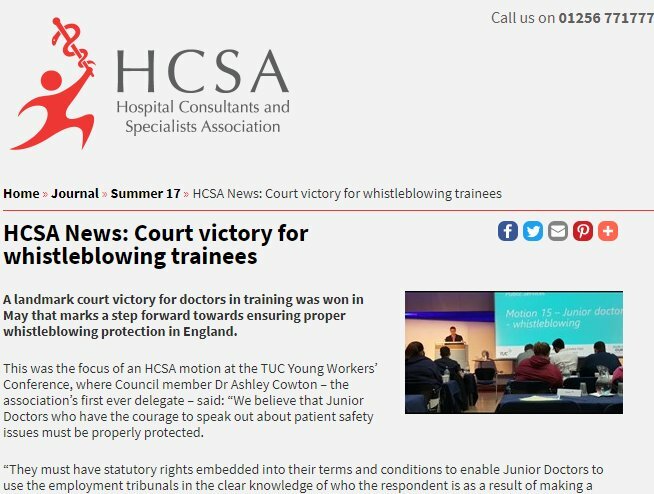 I have been fighting to win back statutory whistleblowing protection for junior doctors against the Government agency HEE for over 2 years with continued resistance from the BMA. I have recently found out that in May 2017, every member of BMA Council apparently voted for a motion to give me BMA support for my case and also to give me some sympathy. The first I heard about this apparently unanimous motion was on Twitter on 23 August, some 3 months after the vote. This came about following allegations being made by Professor Alyson Pollock on Twitter about the voting in the meeting and also the fact she was being investigated for making this information public. Since May I have been trying to find out what went on in this meeting as I heard from a variety of sources that my case was discussed in it. Through doing this I have found myself playing referee to a rather ugly internal BMA dispute about how people voted in this apparently unanimous vote. The end result is me still fighting alone without BMA legal support for my case that will affect all junior doctors. The next stage of my case seeks to use our recent Court of Appeal victory to cement an employment relationship for all junior doctors with their Deanery or HEE. This will bring a lot of the details out in to the open on the influence HEE has over doctors and had in the junior doctor contract negotiations. Who could possibly not want that to happen? This blog attempts to summarise what I have found out about the May 2017 BMA Council meeting. 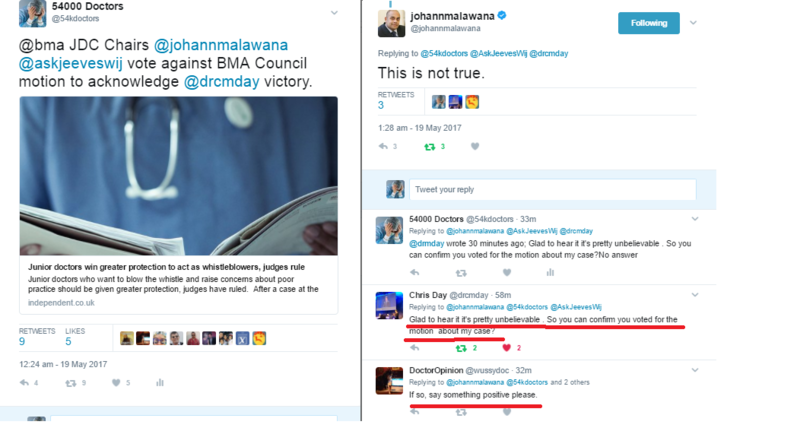 On 19 May, I asked the current and former JDC Chairs, Jeeves Wij and Johann Malawana on Twitter whether or not they voted for a BMA Council motion to support my case. They failed to respond to this question. Johann Malawana had previously confirmed on Twitter to the 54000 doctor campaign that it was not true the suggestion that he voted against the motion. I took that to mean that Johann was likely to have abstained. Jeeves did not respond at all. 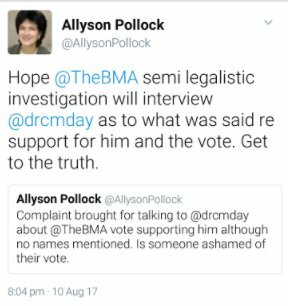 On 10 August, I was made aware of the following Tweets from Professor Allyson Pollock who is widely respected and a highly esteemed member of BMA Council. At a similar time, I received further evidence from within BMA Council which I have no reason to believe is not true. Johann is free to simply deny the following allegations. 1. A conversation took place where a Council member asked Johanna Malawana why he didn’t vote for the motion on my case. 2. Johann Malawana has made a formal complaint against a Council member on the stated basis of the way he voted being made public and the impact of that. On 21 August, I and various other people asked Johann how he and Jeeves voted. His response was non-committal. 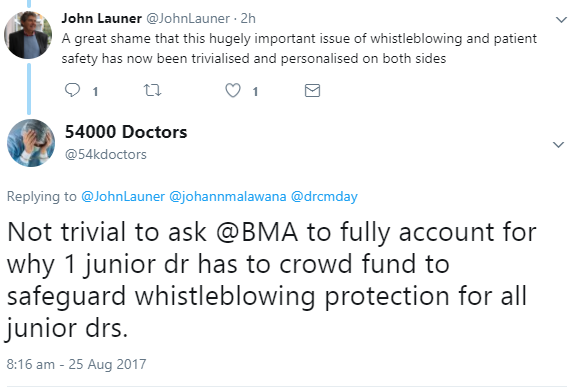 The failure to answer a simple question on how a current and former BMA Chair voted on something as vital as junior doctor whistleblowing protection was deemed by many to be unacceptable. 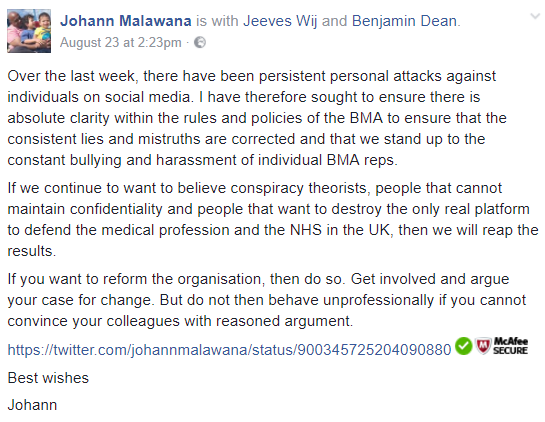 On 23 August, instead of Johann and Jeeves responding the simple question of how they voted on a vital issue at a BMA Council meeting, the BMA Secretariat produced some text which Johann distributed on social media. It contained statements that were not true about my case and campaign. Reading the text carefully it seems to me that the words that should cause worry are obvious: “My minutes inform me..”. In other words “I’m not telling you this is true. I’m just telling you what my notes say.” It is not clear who is responsible for the information. It is worth noting also that the minutes of the May Council meeting have not been published on the BMA’s website. Professor Pollock responded on Twitter the same day as the BMA Secretariat statement. Johann posted the same Secretariat email with a cover Facebook post. We have made it clear that the issues in my case relating to all junior doctors being protected by whistleblowing law can be discussed, including the BMA’s opinion on the Court of Appeal case and Judgment. 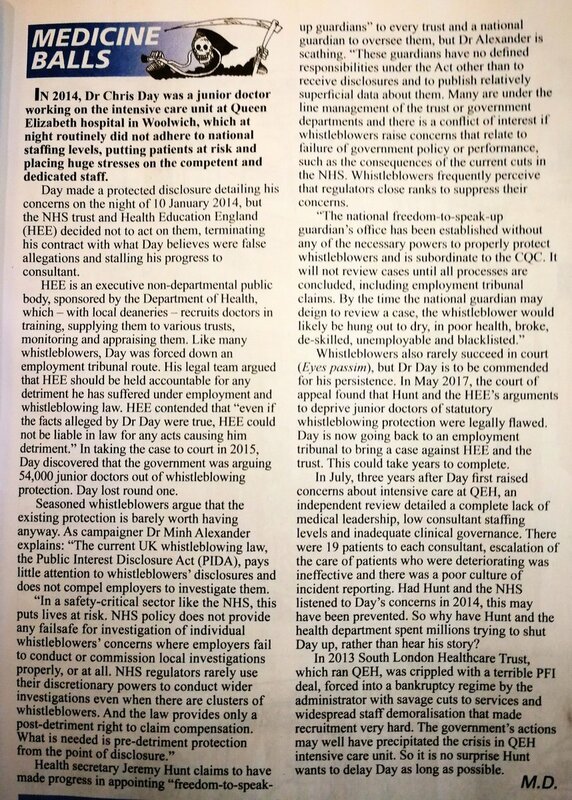 The disputed facts of my individual whistleblowing case have to be kept confidential until they are heard but they are of no relevance to junior doctors’ employment status with HEE. We sent the below letter to the JDC chair and BMA Council, it sets out our position on what can be discussed about the case. In the letter I also offered to attend a BMA JDC meeting to brief the committee on the Court of Appeal case which at the time was within a week of when the JDC were meeting. This request was refused. The Hospital Consultants Specialists Association were able to comment on the Court of Appeal Judgment as have many legal blogs and reports. I have encouraged the BMA to do the same. 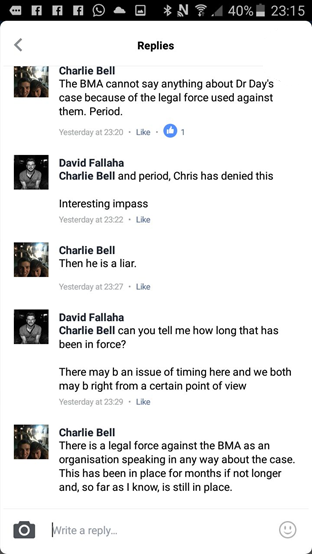 A member of BMA Council, Charlie Bell has already used the BMA Secretariat email as a basis of circulating statements that are not true on social media, this could be seen as blaming the lack of BMA comment on the Court of Appeal case on me and my legal team. “We have since reached out to Dr Day on this basis” “…”the support offered was not required.”. The impression given is that I was offered, and rejected, BMA help with my legal case. Nothing could be further from the truth. That sort of help was ruled out. A few weeks ago I was contacted by a BMA Manager that I had never had previous contact with. I was merely offered a chance to talk through the standard BMA services available to members at what the writer said must be a “stressful time” for me. I was told that discussion about supporting my whistleblowing litigation and my complaints against the BMA would not be possible. I would say given the position me and my family have been put in by the BMA this amounts to nothing more than game playing. Click here to see letter that summarises the relevant exchanges between me and the relevant BMA Manager. Misrepresenting this as me rejecting BMA legal support for my case seems to be the most obvious aim of the BMA Secretariat statement and is already having an effect on social media. This could have a devastating effect on my ability to crowd fund if believed. On 24 August, some 3 months after orginally asking Johann how he voted he finally committed a position in writing about how he voted in the May BMA Council meeting. I don't understand Johann's surprise at being asked to clarify his position on support for my case. 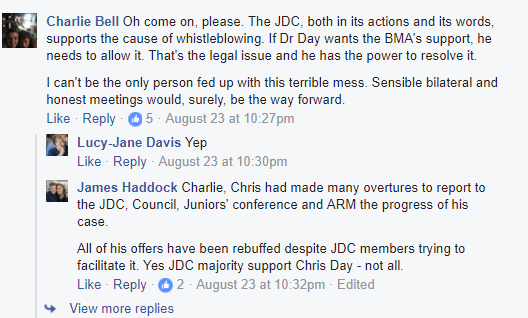 When he was JDC Chair he offered no support to a case that exposed as legally flawed and ended up solving a Government made gap in whistleblowing law affecting all junior doctors. It is obvious how this case could have assisted in the junior doctor dispute. During the dispute I wrote to Johann on two occasions. So as the BMA argue about giving sympathy to a me and a case that has safeguarded the whistleblowing protection of 800,000 agency/contractor workers and is one hearing away from finishing the job for junior doctors, I will end with this Facebook comment. Below is this week’s Private Eye Medicine Balls which I think makes it very clear how important this situation is.